I have very difficult situation at my suburban play station as I have continuous S9++ man-made noise on the low bands. I literally can hear only the loudest stations so I have to wait for the better propagation periods to be able to work DX stations. As I have only a small lot bigger system does not play. More or less the loops remained the only option. 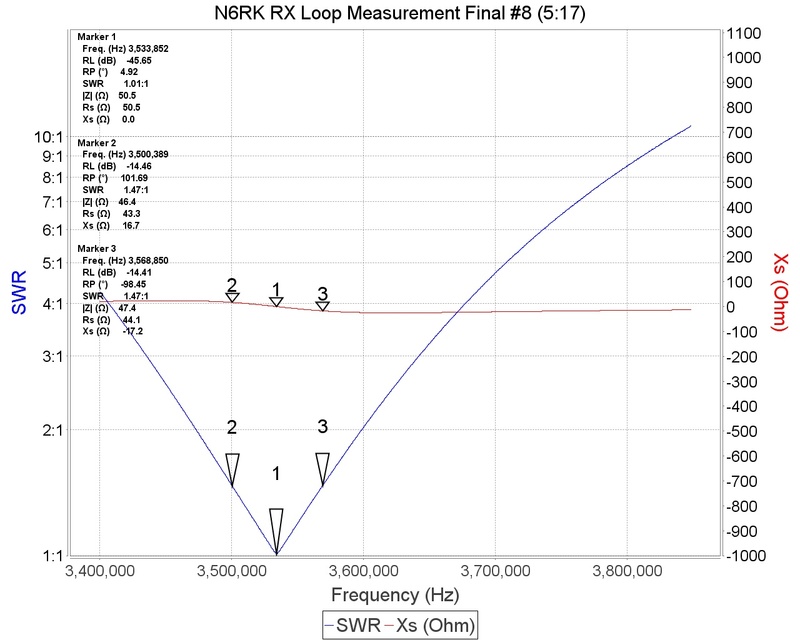 I found N6RK publications (here and here) about his loop concept as well as couple of other practical experiments (K3ZXL and W8WWV) which gave the basics. K3ZXL reported great results on 160m so I’m keen to hear what can I achieve at my place. I decided to go with the perimeter of 364cm which is rather the size for 80m, coax is RG213. The frame is made of PP-R tubes. The shape is diamond similar what W8WWV used. Shield break is 20mm long trying to make the two halves as symmetrical as possible. The transformer utilizes FT50-75 core with T5:T17. It is surprising that the 1.5 bandwidth is almost 70KHz as in according to the literature it should be half of this value but will see on the air tests. I could try it only in the room after the completion. It gives pretty small output so the low dipole has bigger signals (and noise) at that time. As the vertical height is 2m+ I could place it only on its side but it is interesting tho when I held vertically had improved output as well. I’ll find a location on the garage room top to get it out and see the differences.